Isn’t chocolate the universal feel-good food? A new study shows there may be a link between chocolate consumption and symptoms of depression. If you eat chocolate more than eight times a month, it might be a signal that you’re depressed. According to new research published in the Archives of Internal Medicine, there may be a link between the frequency of chocolate consumption and symptoms of depression. Not surprising. Isn’t chocolate the universal feel-good food that we turn to when we’re feeling blue? It would make sense that anyone who is suffering from depression would seek more feel-good vices. The study surveyed more than 900 people about their weekly chocolate consumption and used a standard questionnaire to screen for depression. Subjects who reported eating about 8 servings of chocolate per month had significantly higher scores on the depression scale compared to the non-depressed patients, who consumed an average of a little more than 5 servings per month. Those who scored highest on the depression scale ate more than double the non-depressed patients' chocolate consumption, or nearly 12 servings per month. This study by no means concludes that chocolate causes depression, but it poses several hypotheses. 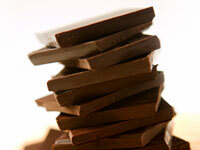 Could depression stimulate chocolate cravings, or could chocolate contribute to depressed mood? Or, could there be an underlying problem that’s causing both the chocolate cravings and depression? While the research is preliminarily, I like to believe that chocolate, for many people, is associated with improving mood. It’s what we go to make us feel better—period. However, sticking my face in a pint of Häagen-Dazs soothes me in the short-term but makes me feel worse later. So, I’ve come up with some healthy indulgences for when only chocolate will do. I’m not much for dessert at breakfast, but I’ve been enjoying my Chocolate Cheerios. I figure that a 150-calorie bowl of cereal with fat-free milk provides chocolate with a gram of fiber, most of the vitamins and minerals I need, and just 9 grams of sugar. It’s not my breakfast of choice, but I like it when only chocolate will do. I’ve been a fan of Vitamuffins for years, but their Dark Chocolate Pomegranate Vitabrownies always surprise me. They taste so good, and they have only 100 calories, plus 6 grams of fiber and cholesterol-lowering plant sterols. Eco Lips Dagoba Certified Organic Chocolate Lip Balm is my newest chocolate treat. It’s calorie-free and leaves my lips lusciously kissable. The smell seems enough to get me over a chocolate craving! I like the mint flavor, made with mint oil and rosemary, but other flavors include chocolate roseberry and chocolate lavender. They’re 100% organic and made with Dagoba’s organic cocoa. Greek yogurt is a nutritional all-star, but make it chocolate and fat-free, and I’m in heaven. Thank you Stonyfield Farm! If you haven’t already, check out their Oikos Organic Pure Chocolate Pleasure Greek Yogurt. It has just 110 calories per serving, is fat-free, and packs in calcium and 10 grams of protein. Another great option is Kozy Shack chocolate puddings because for 110 calories you get 4 grams of fiber, calcium, and vitamin D.